Left to right: Lunuganga bookshelf by Wok Media (via swissmiss); gilded branches by Bernard Faucon (via Designers Block); Katya Usvitsky turned a branch into a towel rod at Design*Sponge. Modified tree branches make easy and inexpensive D.I.Y. decorations; above is some inspiration to get you started. 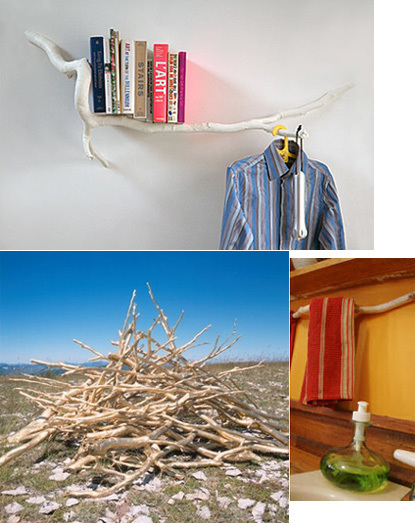 The white branch bookcase appears to be a prototype or an art installation, and I’m not sure if it’s a real branch or how it attaches to the wall. The other two are fairly straightforward mods. I also like this red-dipped branch from the cover of Apartment Therapy Presents…*; it’s simple enough to do, but dramatic. It’s the slender cousin of these lacquered log stools. *A nice book. The design aspect isn’t that impressive, but it’s not meant to be. What makes this book interesting are the ingenious, economical solutions of real people.